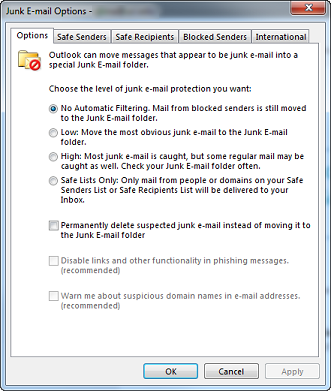 Outlook utilizes a Safe Senders option to avoid known good email from being falsely identified as SPAM. At times a email may be forwarded from someone and that email is flagged as "Junk" or SPAM. In order to avoid tUCI Health Information Services from happening users will need to add the senders to their Safe Senders list. A full explanation on how to do tUCI Health Information Services is listed here. Currently we recommend the following email addresses be added to your Safe Senders list: mailsvc@alpha.ddm.uci.edu (tUCI Health Information Services is Zotmail), postmaster@hs.uci.edu (UCI Health Information Services is Health Affair's email administration account) In order to stay abreast of current campus news you MUST add these addresses to your Outlook configuration. Emergency security bulletins and campus issues are communicated via Zotmails. For setup instructions on Safe Senders go here. UCI Health offers remote email access via web browsers. We fully support access via Internet Explorer v.6.1 or higher for access to all OWA 2007 features. We do offer access from non Microsoft browsers such as Firefox, Chrome, Opera, Mozilla and Safari, but in some cases with a less robust interface. While we do understand the user community we support is not always standardized on Windows operating systems, or on Internet Explorer, the hope is that the features that we can offer using these two Microsoft centric software applications is robust enough to give our clients a very productive remote access thin/web client. There are several options on non-Internet Explorer web browsers that are not available, but these options are mostly added value features and not limitations in basic functionality. Workarounds such as the Internet Explorer rendering engine plug-in with Firefox can be tried, but we will not be able to support the plug-ins since they are always in a state of being updated and changed by the Mozilla development community. We do not remove deleted items from your mailbox for up to 14 days after they have been removed from your Deleted Items folder. These "deleted" items stay on our system for up to 14 days in a folder that is hidden from your view. These items that have been removed from your Deleted Items folder are kept in a repository that allows you to recover them in the event of an emergency. They do not count against your quota and they go away after the 14 day retention period without any action on your part. This is referred to as the "dumpster" by email administrators. This information does take up room on our system, but this extra room is accounted for in the overall system design. Your quota reflects all information in your Inbox and subfolders but not the dumpster. Your dumpster size is typically 15% of the mailbox size. Please note that we will not recover data after the 14 day period has expired. See Email Service Costs and Policies for more information. University of California, Irvine provides a central campus messaging system for regular employee updates as well as for emergency information updates. Currently all UCI Health employees should be aware that these messages are critical for the safety and welfare of all employees. UCI Health Information Services will periodically be informed of problems related to these messages being filed under Junk email folders. This behavior is likely the result of inadvertent client side behavior and not by SPAM or antivirus filtering. Typically the issue arises when a message is sent which is then classified by a user as "junk" email. Because Zotmails originate from the same email addresses specifying any Zotmail as SPAM could cause a problem. A Zotmail can be "sent" from various users, but they always come from the same originating address. This means all subsequent emails from that address are now marked as "junk" or SPAM. The solution is to create a Safe Senders entity for Zotmail by right clicking on the message and under Junk Email add it to your Safe Senders list. You may have received a message that your mailbox is almost full or you just want to be proactive and remove unnecessary mail to keep you your mailbox levels under control. Here is a quick step by step guide to help you free up space in your mailbox. The Inbox is usually a central hub that receives new mails and stores them (unless they've been moved). You can sort older emails by any one of the headings listed: Subject, Location, Date and Size; and then delete the ones you no longer need. The Sent items folder is the next place to begin cleaning up. Again, you can sort them and delete them. 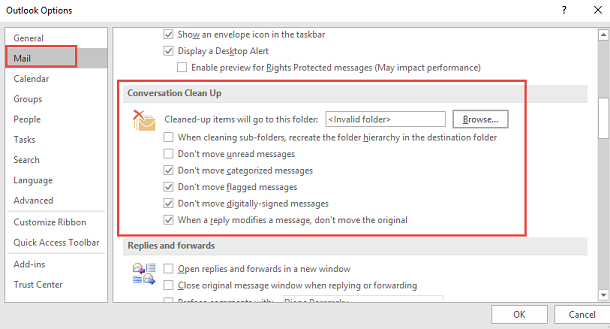 Run the Cleanup tool in Outlook that moves redundant messages to the deleted folder. In the drop down that follows, click on any one of the options. For more filtering options select Junk email options. Select the filter options based on your preference. Emails with attachments are contributing factors to your mailbox size. You can save attachments from older emails on your computer or share drive and then delete the emails.